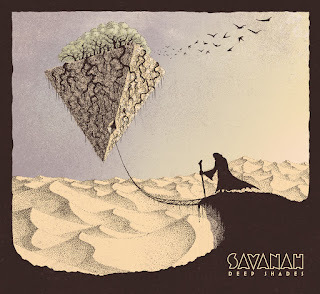 I came across the preview track for Savanah's debut EP "Deep Shades" quite a while back, but the resulting fuzzed out desert rock grooves were well worth the wait. I can't help but feeling like it's a perfect soundtrack for screaming through the desert at dusk in a muscle car. If that's not a prerequisite for quality desert rock, I have no idea what is. The massive riffs suit the sprawling desert landscape perfectly, seemingly just as large. Add to that an excellent sounding rhythm section, plus an interesting, melodic vocal performance, and things tend fall together pretty nicely for these guys. "Blue Reality" opens up with bass heavy rumblings that really grab your attention, after kicking off with a short bass intro the guitar drops in just a little later. The drums aren't far behind, but for most of the time the bass is running the show, with the vocals kicking in after a couple minutes. The higher pitched, doom-like vocals offer a nice contrast to the track. Towards the end of the seven minute track a howling solo shakes things up a good bit, something to awaken the senses. While it's the closer, it's still a great ride, sort of fading off into the darkened horizon after a bit. The whole EP is up for sale on the bandcamp now, for you to check out.